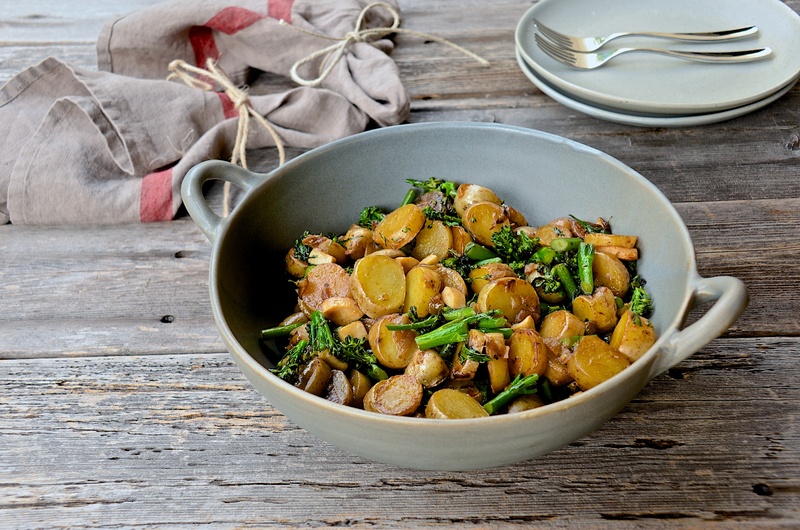 Here is a simple dish to make with either baby potatoes or fingerling potatoes. I steam them first and then sauté in olive oil. I add the broccolini towards the end of the cooking so they finish cooking together. You could cook the broccolin i sep[arately and combine them at the end if you wish. If you don’t have broccolini you could use red pepper or broccoli instead. There are two camps in culinary circles regarding how to sauté potatoes. Some steam or boil them first, other sauté them from a raw state. I prefer to steam them first because it speeds up the cooking time. Raw potatoes can take a lot of time to cook and you would need a fair bit of oil to finish the cooking. If you cooke them raw, because of the starch content they can be golden and crispy on the outside, but inside they are not fully cooked. By steaming them first you insure against uncooked potatoes. By the time you read this we would be on our way towards the PCH, USA Route 101. We are taking a road trip to central California to visit family and attend an event at Cass Winery near Paso Robles. I look forward to exploring new territory and hope to report on the adventure on these pages. 1 lb fingerling or baby potatoes, or Yukon Gold if you wish. Steam the potatoes over boiling water until easily pierced with a knife. They don’t have to be fully cooked. Remove and cool. When cool enough to handle peel off the skin and cut in half if you use baby potatoes, or in a few slices if you use fingerling. Heat the oil in a large skillet. Add the onion and cook until softened, about 3 minutes. Add the potatoes and cook over medium heat stirring gently every now and then. If the skillet seems dry you can water, a little at a time, and let it evaporate before adding more. Cook the potatoes until they are soft and golden. Halfway through the cooking add the herbs and mix them in. Towards the end of the cooking add the broccolini and continue to cook until the broccolini is cooked to your liking. I like it to remain a little crisp. Loooove this recipe! What stunning photographs too. 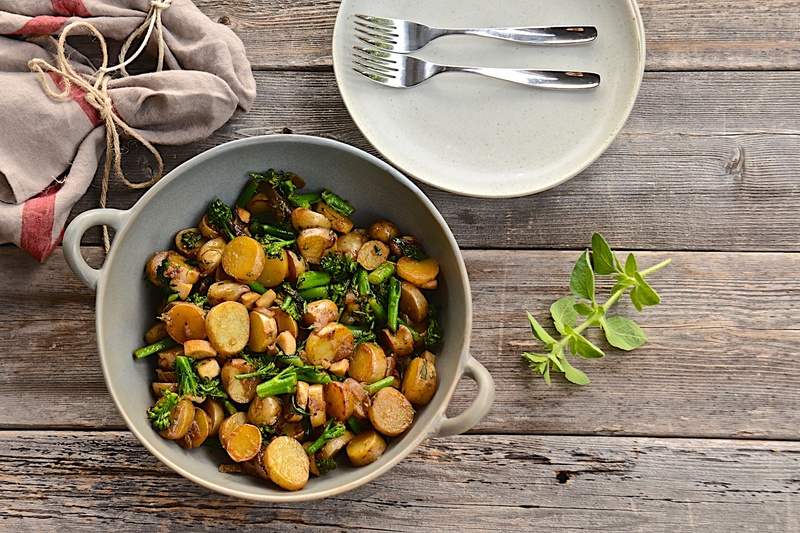 Broccoli and potatoes are two of my favourite foods, and the flavours you paired them with sound delicious! I will have to make these!